Deep fry the eggplants whole or grill them on a griddle. Sweat the onions in the oil. Stir in the garlic, the ground beef, and the spices. Cook until the meat is cooked all the way through. Stir in 2 tablespoons of the tomato concasse. Cook for a few minutes then turn off the heat. 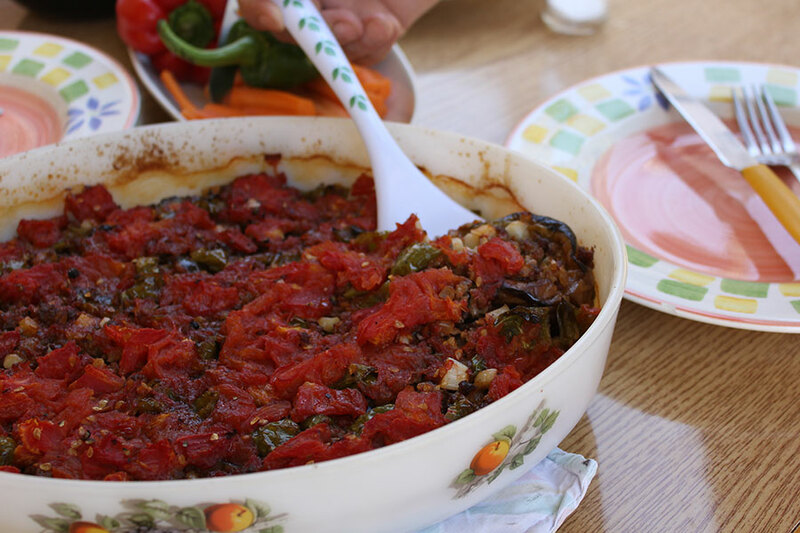 Deeply score the eggplants lengthwise and arrange the eggplants in a casserole. Fill each eggplant with the mixture. Sweat the pepper and spread it over the casserole. Bring the tomatoes and the water to a boil, season and spread over the casserole. Bake in the oven for about 30 to 40 minutes until all the water has evaporated.